I will post here the cyrillic alphabet for future translations. Maybe its helpful. Ъ ъ (tvyawrdy znak) = ? ь Ь (miakhky znak) = ? I've pinned this up top so those of us without the computer ability to type in Cyrillic can copy and paste letters in threads. I'll plunk in some complete words or abbreviations so those can be copy pasted all at once. If you can think of any others to add to a "ready made" list, add them below, and I will put them in here in the alphabetical list. For typing in a thread, I recommend copy pasting Gerd's entire alphabet above, pasting it into your thread, and then you can plunk in one letter at a a time without going back and forth editing endlessly. Just remember to DELETE the alaphabet out of your post when you're done!!! This is how I am going up and down copy pasting one letter at a time making the most common abbreviations/slash words we will use, so that way we can just copy click a complete abbreviation or word faster. Ха Ха Ха Молодцы!!! I thought I joined Military Interest Club but actually Transformational Linguistics!!! If you have problems with Russian just contact me or other Russian guys in the club and you will save your time! This is cool! It is like a language class. What are the rules of sentance formations and what are the verb conjugations? I'm pretty new here, and I always have trouble telling when someone is asking a question in jest or is really serious. I'm also a beginning-level student of Russian. Just in case you were serious in asking the above, you could do a lot worse than http://www.alphadictionary.com/rusgrammar/ . There are a bunch of conversational Russian sites on the web, but this one is more or less devoted to Russian grammar. Sentence formation is pretty loose in ordinary usage. You can mimic English in subject-verb-predicate formation, but it will not sound like ordinary Russian usage. It's the six cases that really give meaning to Russian. And there are no articles, which takes some getting used to. Only three tenses, though, which kind of evens things out. Try googling "Russian grammar". There are a LOT of useful sites. Check out several of them. I enjoy learning, speaking and even writing Russian to the extent I can, which is rudimentary. I hope you decide to study it. I just thought that since no one had answered your question yet, I would give it a try. I'm pretty fluent in Russian so if you need translation for something, just ask in the thread and I'll be more than happy to translate. As always Rusty, thanks for your help. it is much appreciated. I also use ImTranslator Prompt Online 2.1 to do some translation. Although not exhaustive, it assists and it is free. There are several online translators that I use myself. Usually I'm not too fond of typing in Russian using English keyboard and it's much faster to have it pre-done by the computer. I've noticed several online translators have diferent engines translating which gives different output. I think it's time to invest into a Russian keyboard! ImTranslator Prompt Online 2.1 comes with a built-in virtual keyboard. You choose the language and use the virtual keyboard by clicking the letters with the mouse. Thank you for pinning the Cyrillic alphabet to this forum. It's a BIG help for someone like me. I cannot read, write or speak Russian. Now I can decipher some of my documents, etc. Order of the Badge of Honor	= Орден "Знак Почета"
Order for Service in the...	= Орден "За службу Родине в ВС СССР"
Order for Personal Courage	= Орден "За личное мужество"
Order of Maternal Glory	= Орден "Материнская Слава"
Medal for Distinguished Labor	= Медаль "За трудовую доблесть"
Medal for Valiant Labor	= Медаль "За трудовое отличие"
Medal Veteran of Labor	= Медаль "Ветеран труда"
Medal for Bravery	= Медаль "За отвагу"
Comb...ahem Military Merit Medal	= Медаль "За боевые заслуги"
Partisan Medal	= Медаль "Партизану Отечественной войны"
Medal Guarding the State Border = Медаль "За отличие в охране государственной границы СССР"
Medal for Distinguished Mil.Ser. = Медаль "За отличие в воинской службе"
Medal Veteran of the Armed Forces	= Медаль "Ветеран Вооруженных Сил СССР"
Medal for Strengthening Military...	= Медаль "За укрепление боевого содружества"
Medal Defense of Leningrad	= Медаль "За оборону Ленинграда"
Medal Defense of Moscow	= Медаль "За оборону Москвы"
Medal Defense of Odessa	= Медаль "За оборону Одессы"
Medal Defense of Sevastopol	= Медаль "За оборону Севастополя"
Medal Defense of Stalingrad	= Медаль "За оборону Сталинграда"
Medal Defense of Kiev	= Медаль "За оборону Киева"
Medal Defense of the Caucasus	= Медаль "За оборону Кавказа"
Medal Defense of the Soviet Polar Reg. = Медаль "За оборону Советского Заполярья"
Medal Victory over Germany	= Медаль "За победу над Германией в Великой Отечественной войне 1941-1945 гг"
Medal Victory over Japan	= Медаль "За победу над Японией"
Medal Capture of Budapest	= Медаль "За взятие Будапешта"
Medal Capture of Koenigsberg	= Медаль "За взятие Кенигсберга"
Medal Capture of Vienna	= Медаль "За взятие Вены"
Medal Capture of Berlin	= Медаль "За взятие Берлина"
Medal Liberation of Belgrade	= Медаль "За освобождение Белграда"
Medal Liberation of Warsaw	= Медаль "За освобождение Варшавы"
Medal Liberation of Prague	= Медаль "За освобождение Праги"
Medal for Valiant Labor in GPW...	= Медаль "За доблестный труд в Великой Отечественной войне 1941-1945 гг"
Medal for the Restoration of the BME	= Медаль "За восстановление предприятий черной металлургии юга"
Medal for the Restoration of the DCM	= Медаль "За восстановление угольных шахт Донбасса"
Medal for the Development of VL	= Медаль "За освоение целинных земель"
Medal for the Construction of the BAM	= Медаль "За строительство Байкало-Амурской магистрали"
Medal for Development of the NBE Reg...	= Медаль "За преобразование Нечерноземья РСФСР"
Medal for Development of the PC of WS	= Медаль "За освоение недр и развитие нефтегазового комплекса Западной Сибири"
Medal for Preservation of Public Order	= Медаль "За отличную службу по охране общественного порядка"
Medal for Bravery in a Fire	= Медаль "За отвагу на пожаре"
Medal for Saving Life from Drowning	= Медаль "За спасение утопающих"
100 years Lenin Birthday Medal	= Юбилейная медаль "За доблестный труд (За воинскую доблесть). В ознаменование 100-летия со дня рождения Владимира Ильича Ленина"
Medal 20 years Victory in GPW	= Юбилейная медаль "Двадцать лет победы в Великой Отечественной войне 1941-1945 гг." Medal 30 years Victory in GPW	= Юбилейная медаль "Тридцать лет победы в Великой Отечественной войне 1941-1945 гг." 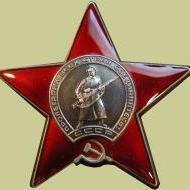 Medal 40 years Victory in GPW	= Юбилейная медаль "Сорок лет победы в Великой Отечественной войне 1941-1945 гг." Medal 20 years RKKA	= Юбилейная медаль "ХХ лет Рабоче-Крестьянской Красной Армии"
Medal 30 years soviet army and navy	= Юбилейная медаль "30 лет Советской Армии и Флота"
Medal 40 years armed forces of the ussr	= Юбилейная медаль "40 лет Вооруженных Сил СССР"
Medal 50 years armed forces of the ussr = Юбилейная медаль "50 лет Вооруженных Сил СССР"
Medal 60 years armed forces of the ussr	= Юбилейная медаль "60 лет Вооруженных Сил СССР"
Medal 70 years armed forces of the ussr = Юбилейная медаль "70 лет Вооруженных Сил СССР"
Medal 50 years soviet militia	= Юбилейная медаль "50 лет советской милиции"
Medal 800 years Moscow	= Медаль "В память 800-летия Москвы"
Medal 250 years Leningrad	= Медаль "В память 250-летия Ленинграда"
Medal 1500 years Kiev	= Медаль "В память 1500-летия Киева"
Motherhood Medal	= Медаль "Медаль материнства"
Thanks, Gerd. You've given us a very useful quick reference list. How many times I have wished the Red Bible had included the real names of all these awards!! I shall now print this out and glue it inside the back cover. I love that guide to pronunciation of the Cyrillic alphabet. I also would be glad to help with translations/interpretations from Russian, Ukrainian and Polish to English or in rewerse. I am currently learning German at school, and I plan to learn Russian after I graduate. It is a great sounding language. First, WELCOME to the forum!!! Second, best of luck with your language studies. Work hard, those skills will carry you far!!! Thanks, I will be sure to. Gerd said that youhave some tips on displaying medals. I am just starting out and I just dont know how to display my fleging collection. Any tips would be appreciated. You are Welcome!! What type of medals and/or badges are you trying to display? What type of display case are you going to use? Let me know and I'll help you from start to finish!!! Gerd, Thank you for the referrence!! Liberation of the Ukraine and three other medals that i am yet to indentify. They are all in a shoebox and that doesn't do justice to the medals. If I am unable to buy them I could always make them myself (i'm pretty nifty with my hands).